This is such a pretty charcoal gray! I love it and I’m sure I will wear it a lot this fall and winter. I bought this polish months ago. I bought it because of the name, Kelly. Kelly is the daughter of a friend of mine. We have been friends for years and years! When the kids were little I would pick Kelly up for school every morning. 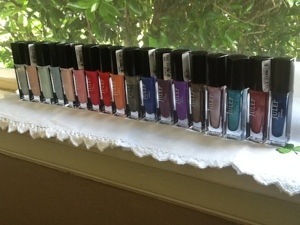 I was surprised at some of the names from Zoya that they do not have available. For instance they have no Judi, Jilly, Jeanie, Cindy, Jami, Emma, Mary Lou, Betsy, Elizabeth, Catherine, etc…. The few names that are special to me that Zoya does have I, of course bought, and Kelly is one of them. Zoya always has such a nice formula to work with. I love their bottle shape, the brush is great and I like it that they seem to have great promotions once in a while. 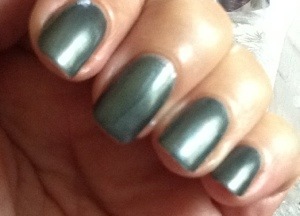 When they offer something with free shipping is usually when I buy Zoya. If you haven’t already, you should go to Zoya’s website and create an account. That way you will be informed of all their promotions. One of my all time favorite pictures of the kids when they were little. 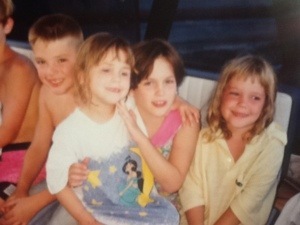 On the left is my son Drew, then Kelly with her sister Emma on her lap and the my daughter Jilly. This was coming home, in a jet boat going down the Snake River, out of Hell’s Canyon, after a long week end of summer fun! You can see the sun on the kids’ cheeks and you can tell they had fun but they are tired babies! Another of my favorite pictures! 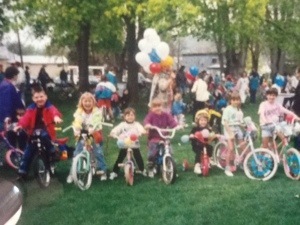 This is all the kids getting ready to ride their bikes in a parade. I know every one of these kids in the picture and they are now full grown adults, all are educated and employed! Which in this economy says a lot! Some are married with kids of their own, including Kelly, who now has 3 little boys of her own. Another of my favorite pictures I had to include when thinking about Kelly and her family. Her Grandpa owned the Kirby Creek Lodge, which is in the heart of Hell’s Canyon. They have it rented out for literally 2 years ahead, but every Memorial Day week end is saved for family and friends. We were lucky enough to be included in these outings on a few occasions. 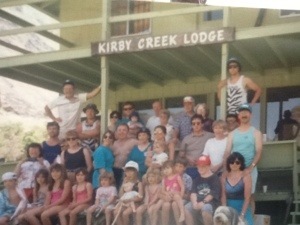 Some of my favorite memories of summer include the Kirby Creek Lodge! 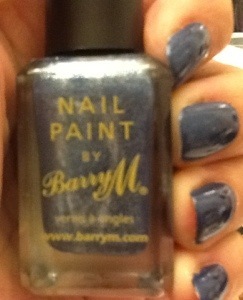 This is Bright Purple from Barry M. This color is right on for this fall’s trend of the dark maroon, gem colors. There is something about this polish, when you wear it, your nails “feel” like they are stronger, harder and more flexible, all at the same time. This is Bright Pink from Barry M.
My new favorite blue, Denim. This picture is with a topcoat, but it does dry matte and next time I wear it, I am not going to apply the topcoat because it is very cool with the matte finish. This is Vivid Purple. This is a gorgeous purple, that wears like iron! This is Mushroom, and Grey. The Grey looks blue in some lighting. I feel so fortunate for my friends across the pond, and I feel very fortunate to have these great polishes in my collection. This is Sophie from Julep’s Trina Turk collection for Fall 2012. Trina Turk is an amazing designer who partnered with Julep to coordinate the colors of her collection with Julep’s August selections. 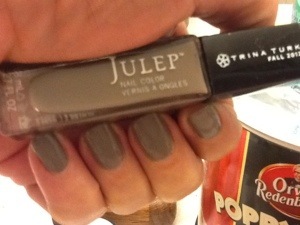 Trina Turk is a real deal designer, and I was impressed with the collaboration between TT and Julep. She designs a full line of women’s ready to wear, swimwear and has a men’s line as well as a jewelry line. Her dresses this year reminded me so much of the 70’s. I would totally wear both of these dresses, and I’m sure I wore something very similar in the 70’s. Maybe that is why I really love her clothes. Trina Turk has a beautiful website and her clothes can also be found in all the major retail stores, like Bloomingdales, etc…. Sophie is a nice mushroom color, very wearable, perfect for this time of year. I just cut my nails back, as they were getting too long for me, and I think this color looks great on shorter nails. I think by now you all know Julep is a subscription based service for nail polish. If you haven’t signed up yet, you can still get your first box for ONE PENNY. I think this is a deal that cannot be beat, it’s ONE PENNY, no delivery charge, no handling fee, just one penny charged to your card and you get a box with 2 polishes, and either a full size hand cream or glycolic hand scrub and then usually an emery board, some sample products and other goodies. Their packaging is immaculate and the introductory box is impressive, especially for ONE PENNY! To get this deal, click the link above and at checkout, use the code COLOR2012, or NYFW2012. 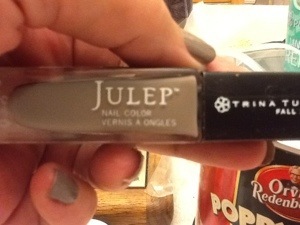 Julep nail polish is definitely a great polish. The formula is perfect, usually full coverage with no VNL in one coat, great colors and they offer amazing sales and mystery boxes, which are always fun. You know I can’t pass up a good mystery box. The cost for the program is $19.99 per month, but they make it very easy to skip a month. To tell the truth I’ve skipped almost every month this summer because I did not care for the metallics and magnetics they offered. The August box was awesome but for September they are offering crackle. You can imagine the uproar from all the nail polish junkies, and I must say I am impressed Julep acted almost immediately and offered a “Maven’s Box” that was a box of 3 polishes, all cream finish and some nice colors. I did get that box. But really, crackle? I will be keeping my eye on Julep because they are supposed to be trendsetting with their colors but the last few months have not been so much trendsetting as playing catch up. Crackle? 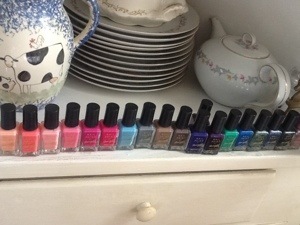 This is about half the Julep polishes I have, they are pretty all lined up! I love this idea so much I stole it and made a You Tube video about! join in the fun! 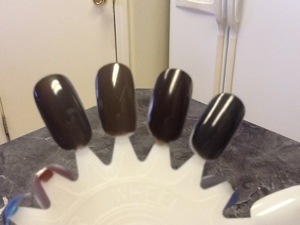 Just a quick post, I wanted to show you these Wet n Wild polishes out now, for Halloween. 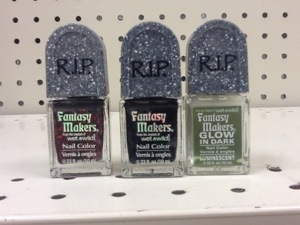 They are on sale at my Shopko for 99 cents, but they are selling fast. This is a black cream with bright red micro glitter. This is certainly one I would call a gem, especially for this coming fall 2012. This fall is all about the deep rich colors along with the nudes. This is Foubert’s Place from Nails, Inc. I bought this from Sephora months ago when it was on sale for $5. The formula in the Nails Inc polishes are so rich, I had great coverage with 1 coat, but you know me, I always do 2 coats for my 50 Shades of Sunday colors and for reviews. This looks like an army green in the bottle. It’s a cloudy day but I think you can see better from the above picture the color of it in the bottle. It is much darker on the nails. But, like I said the formula is great, a little on the thick side, but not so much as to be goopy. I am going to “test” wear this polish as this is the final brand I am testing out for my upcoming polish by comparison post I have been promising. I will be glad when that is done. I have been working on it all summer! 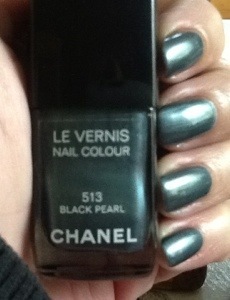 I like this polish very much and will be pulling it out more now that I’ve discovered it again! 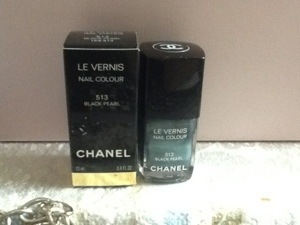 It is very similar to Essie’s Power Clutch. If you own that, there is no need for you to get Foubert’s Place. 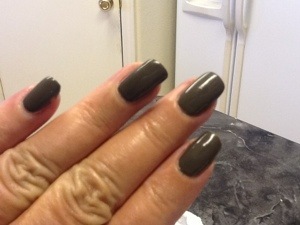 Another one very similar is OPI’s Get in the Espresso Lane and Nein! Nein! Nein! Ok, fine! These 2 are also close but GITEL is darker along with NNNOF! being darker and a little more on the gray side. I’ve swatched them below. On the left is Power Clutch, then Foubert’s Place, GITEL and NNNOF! All in all I would give this polish 4 out of 5 stars. You know I’m a sucker for a straight up cream and I’m loving the dark, smoky, gray, green colors. I really like this polish, oh, I guess I said that! It’s the menopause mush brain at work again. This is me when I was 17 with my high school boyfriend. He’d just given me a “promise” ring. He was the sweetest, nicest, best boyfriend a girl could ask for!. I thought all boyfriends were like him. When we broke up and I started dating other guys I was literally shocked at their behavior! I remember one time walking in on my “boyfriend” with another girl and I was like but I’m your girlfriend and you’re my “boyfriend”? I just couldn’t wrap my head around it that not all boyfriends were like Joe. He’s one of the good guys!